The TakeAway: Bob Monks believes new corporate governance reforms fall short, but digital tools can help advance accountability goals. 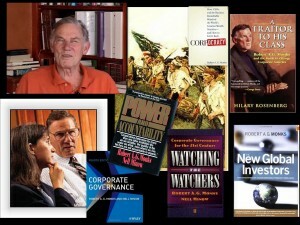 Robert A.G. Monks has a long history of pioneering work on corporate accountability. From his tenure as first Department of Labor pension administrator (ERISA) during the Reagan administration, to his controversial 1991 campaign for a seat on the board of Sears, Roebuck, to co-founding (with Nell Minow) Institutional Shareholder Services (ISS) in 1985, to co-founding LENS (1991), The Corporate Library (1999), and co-authorship (with Minow) of the foundation text, Corporate Governance (1985, with 5th edition forthcoming), as well as many related books, Monks has helped elevate corporate governance to the level of a profession. We checked in with him about recent regulatory changes, and their implications. Marcy Murninghan: What’s your perspective on the corporate governance reforms enacted at the Federal level? BM: Because the business community appears to feel quite comfortable about its ability to influence legislation, to influence the drafting of regulations, to influence enforcement. … They’re increasingly concerned by the prospect of being meaningfully accountable in a legitimate governance system to shareholders. MM: You’re referring to proxy access – namely, shareholder rights to nominate board candidates? BM: Yes. It’s quite difficult to understand in advance what the impact of that is. I can just tell you my experience. MM: You’re referring to the 3 percent ownership threshold in the new SEC proxy access rule? BM: Yes. My experience is, it is very difficult to get institutional investors to act in concert. Mainly because all trustees, with an obligation as fiduciaries to their own beneficiaries, are extremely allergic to appearing to be delegating or diminishing in any way the purity of that commitment. And for a trustee to cooperate with other trustees, and give up some sovereignty of the control, means putting themselves in a position where something may happen – that might marginally differ from what they would have done if it was entirely up to them. This creates a level of anxiety in the trustees, as to whether they’ve created liability for themselves. They subject themselves to criticism. Therefore, it’s very unlikely to be able to put together a coalition of trustees. You have the problem of, How do you get 3 percent? A few of the index funds, who are among the least likely to be proposing directors, might have 3 percent. But very few of the “active investors” do — I don’t believe CalPERS has 3 percent of any of the top 100 companies. So, it may be that once again the apparent reasonability of a goal like 3 percent, in fact, is not [easily] met, and therefore the provision is dead on arrival. MM: So you dispute the viability of these thresholds, and believe there’s a problem with fund collaboration – large funds, particularly – on who would be a good candidate to nominate, or what the optimal criteria might be, for board membership. BM: You know, it’s a lot easier to get a group of institutions to agree that they want to change a board, than it is to get a group of institutions to agree on a particular individual to be selected as their candidate. … And in the public fund area, if you’re putting up a person as a nominee, you are making a political statement. … Reasonable people can disagree. The recent Supreme Court nomination hearings are an example, that people can disagree about people, even people who on their face seem to be overwhelmingly qualified. Nevertheless, reasonable people can think that they’re not appropriate for the particular position. … If you’re a public fund trustee, and you have to get reelected by the membership to your position, are you going to take that chance? MM: That’s a pretty discouraging picture. Where are the bright spots? What about the impact of interactive technology on corporate governance and board elections? BM: Well, this certainly is part of the good news, because it is now possible to deal with all of the theoretical conflicts of interest, and to allow for meaningful participation by all those with a beneficial interest, who represent about 70 percent of the holdings. Modern technology provides the realistic prospect that you can be in touch with the beneficial owners – who are the ultimate owners of securities – at no cost, and that they can communicate, again, at no cost, timely instructions to vote. So, the whole problem of legitimacy can be solved today. And that’s an enormous step. So, in theory, we’re in a position where it actually is possible to think of a solution that is really elegant, and that, in time, can be very good. But, having said that, I don’t want to obscure the rather unhappy note that one shouldn’t be confused by the theoretical possibility of a correct solution, and the absolute absence of libido, by those with power to accomplish it. And indeed, it would appear worse than that because, by the middle of 2010, the business community appears to have made a decision that they would oppose advances in corporate governance and they would prefer to take their chances with governmental regulations and the courts. EDITOR’S NOTE: This is the first in our Notable People interview series here at The Murninghan Post, featuring in-depth conversations with thought leaders and doers in the broad field of sustainability policy and practice, corporate governance, and investing. This entry was posted in Corporate Governance, Corporate Sustainability, Interactive Technology, Investor Governance, Notable People, Proxy Voting, Public Policy, Stakeholder Engagement, Sustainable Investing, Web 2.0 and tagged beneficial owners, Bob Monks, CalPERS, Corporate Governance, ERISA, institutional investors, Institutional Shareholder Services (ISS), interactive technology, LENS, Nell Minow, proxy access, Robert A.G. Monks, Roebuck, Sears, SEC, The Corporate Library, trustee. Bookmark the permalink. Marcy – This is great! I started a series of interviews back in 1996. Unfortunately, I got distracted after two. I hope you have more perseverance. Excellent choice for your first “notable” person. Nice interview, Marcy. Just one point I’ll make here. It’s interesting that Mr. Monks surmises “the business community appears to feel quite comfortable about its ability to influence legislation, to influence the drafting of regulations, to influence enforcement.” If that were the case, the Dodd-Frank Act would never have been passed and signed into law. In the next breath, Mr. Monks observes “it is very difficult to get institutional investors to act in concert.” I think it is just as difficult to get the business community to act in concert, for many of the same reasons institutional investors eventually back away from doing so, as Mr. Monks goes on to summarize. I find it interesting how each side views the other as the vast conspiracy when we all understand the diversity of thought on both sides. I think it’s time we each make a conscious effort stop making these broad generalizations (of which I, too, am from time-to-time guilty) and work along a more constructive path of finding those who believe in pragmatic consensus-building. Electronic media (such as this blog) and other modern technologies can help us find one another and facilitate this work. Thanks to both of you, Jim and Doug, for your comments! Jim, I’d love to see / hear the interviews you conducted; they’re part of an oral history legacy that should be preserved. I’ve known Bob since 1985, and have interviewed him for several projects over the years, but don’t have all the tapes. As you think of them, please forward ideas for other candidates for “Notable Person”. And Doug, thanks for a typically thoughtful response. Bob’s not your average Republican business person, and is prone to make controversial statements in an effort to draw attention to issues that often get overlooked. That’s not to say he doesn’t have a point: there was terrific pressure on the reconciliation process, particularly concerning proxy access (the initial threshold was 5 percent, which as Bob told me earlier, was equivalent to a man with eight-foot long feet: There ain’t any), which is why that issue was punted back to the SEC. In the midst of all that, it was hard to see where the public interest was being served. We need more business and political leaders who are able to do that–indeed, some are in the wings, but we’ll have to see…. Thanks again, to you both. thanks for the interview, I agree that management tries to protect its autonomy, and the window of opportunity to use the financial crisis to leverage real reform has passed. I do find it strange that proponents of governance reform put so much energy into accountability to shareholders – true, this helps prevent Enron-style fraud and mismanagement, but in my view, the bigger issue for corporate governance is the need to make companies accountable to multiple goals and stakeholders – environmental, community, labor, etc. I’ll be talking about this at a workshop on “global governance for sustainability” this Friday at the Boston University’s Pardee center. I’ve known Bob since age 12 – a remarkable person! I have the honor of acting as a senior adviser to The Corporate Library, helping to identify non-financial or extra-financial factors that might lead to corporate out-performance. Money mangers have a difficult time finding alpha – adding value- these soft factors are a useful place to be looking. I write only to identify another hugely contentious field that demands communication and collaboration – namely public education. I am working with EducationEvolving in Minneapolis, the group that got the charter movement off the ground in the late 1980’s. They now propose teacher -led schools, organized as professional partnerships, and housed in Innovation Sectors within districts- a different idea than charters. These schools can be/are union compatible (they exist already in a number of locations). Both the NY Times and the Christian Science Monitor had articles on teacher-led schools the same day – September 6. The whole concept is to invert the top down structure of public education, putting the responsibility for outcomes with the teachers themselves by giving them control over what matters (budgets, curriculum, schedules, staffing). I suggest a great interview on this subject would be Ted Kolderie, co-founder, along with Joe Graba, of EducationEvolving (www.educationevolving.org). They were both visiting with Arnie Duncan a couple of months ago on the subject. Joe is a member of TURN, the Teachers Union Reform Network, which is getting behind this idea.